Special-ordered from Ibanez and usually arrives to you within 7-10 Days. Please note: special orders cannot be canceled or returned. Get More Out of Your H1 Handy Recorder! Get an amazing deal on a complete accessory package for your Zoom H1 Handy Recorder! Indoors or out in the field, the Zoom H1 Accessory Package comes with everything you need to dive into serious recording with your Zoom H1. A custom windscreen lets you record outside with confidence. Even if the wind picks up, you'll be able to capture outdoor performances and sound effects in full detail. Concerned about scratching up your H1 when you carry it in your pocket or your purse? Don't worry, the soft protective case included in the H1 Accessory Package will keep your H1 safe from scratches, without adding bulk. Indoors, you'll love the flexibility that the Zoom H1 Accessory Package gives you. A mic clip adapter lets you mount your H1 to any standard microphone stand - just the thing you need to record private practices or band rehearsals. You can also set your H1 on a table and aim it at the front of lecture halls or boardroom meetings by mounting it on the included tripod stand. And batteries aren't an issue at all, as long as there's an outlet nearby, thanks to the Zoom H1 Accessory Package's USB-style AC adapter and included USB cable. 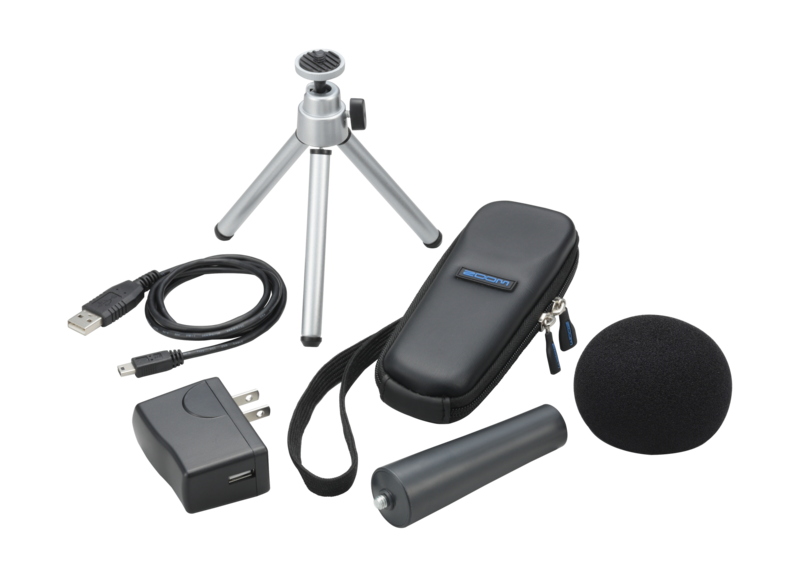 With the Zoom H1 Accessory Package, you'll find everything you need to get the most out of your Zoom H1 Handy Recorder!